to the rice seed production training at the PhilRice Central Experiment Station. MUÑOZ, Philippines—The Philippine Rice Research Institute (PhilRice) Central Experiment Station in Nueva Ecija is currently hosting a training designed to provide participants with knowledge and skills in rice seed production and the promotion of quality seed among African farmers. 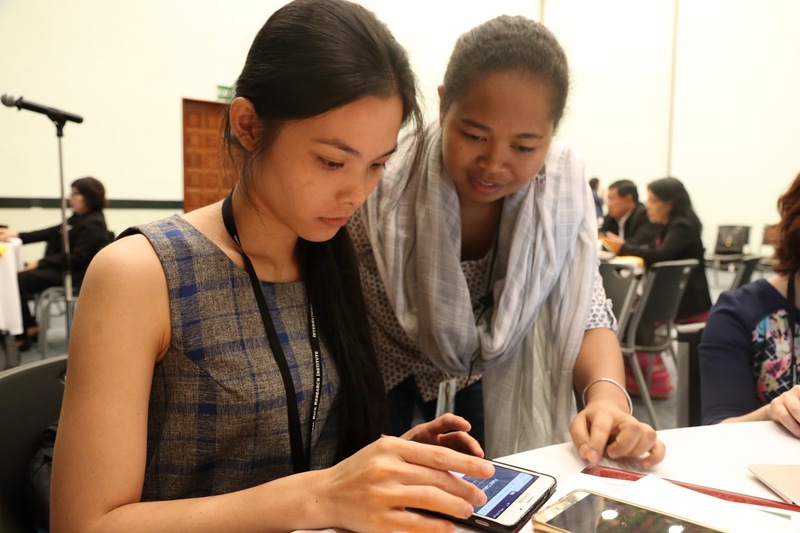 The specialized course on rice seed production and extension methods, a collaborative initiative of the International Rice Research Institute (IRRI) and its Philippine research partner PhilRice, runs from 6 March to 28 April. The course covers land and seedling preparation, planting, field problem diagnosis, harvesting, and postharvest practices. Extension methods and technology transfer strategies promoting the use of quality seeds will also be a key component of the program. From 9 to 16 April, the participants will be at the IRRI headquarters in Laguna for some supplementary field, laboratory, and classroom activities. There are 19 participants from Ethiopia, Ghana, Kenya, Mozambique, Sierra Leone, Tanzania, and Uganda attending the 8-week course. The participants were selected based on the work they do in their respective countries’ agricultural research institutions and public extension programs. Others represent non-government organizations, universities, and the private sector. In addition, 10 participants from the Philippine Department of Agriculture are also attending. The training program is one of the activities under the Extension Capacity Development for Rice Food Security in Africa Project, which is funded by the Japan International Cooperation Agency. This project stands alongside the rice value chain improvement initiatives of different members of the Coalition of African Rice Development and aims to contribute to the fulfillment of the respective national rice development strategies of its member countries. Farmers from four townships covered by MyRice and CORIGAP projects attended the workshop on laser land leveling. They also shared the current best management practices they are trying out in their farms during a Learning Alliance meeting. MAUBIN, Myanmar—The Ayeyarwaddy Delta, the rice bowl of Myanmar, is endowed with vast land and water resources. However, traditional practices prevent smallholder farmers from achieving optimal rice yields. Increasing farmers’ incomes and productivity require technological innovations such as laser land leveling. “The precision land leveling using laser-guided system is a technology option that provides a more even land surface resulting in improved crop productivity through reduced irrigation water, chemical input, and more uniform crop growth,” said Engr. Caling Balingbing, an agricultural engineer from the Postharvest and Mechanization Unit at the International Rice Research Institute (IRRI). Balingbing was one of the experts tapped for a laser land leveling demonstration in Maubin on 23 March. 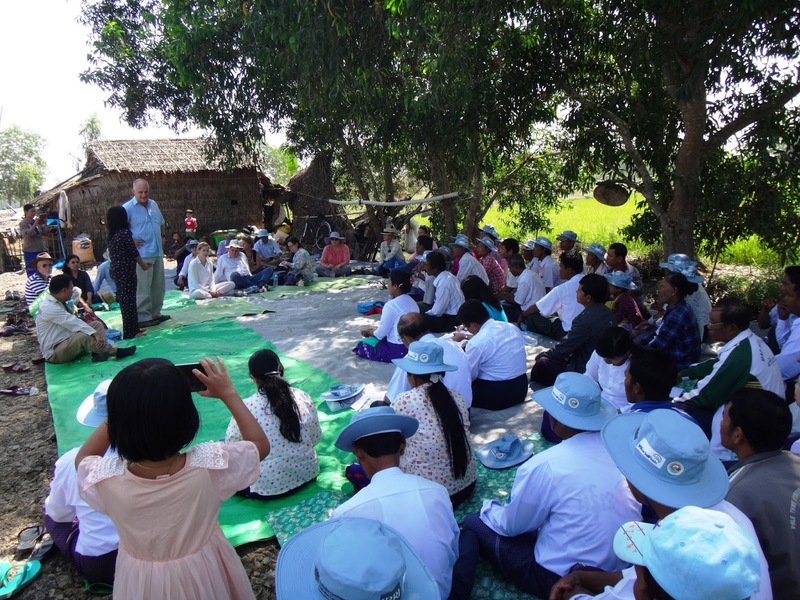 About 60 farmers, extension agents, and private sector and non-government organization personnel from Daik-U, Hlegu, Maubin, and Letpadan Townships participated in the demonstration as an option for better crop management. The activity is part of the Learning Alliance, which brings varied stakeholders with similar interests to assess and develop ways to optimize the use of rice-based technologies and practices. 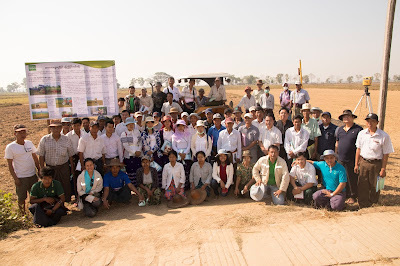 Other IRRI experts at the laser land leveling demonstration were Yan Lin Aung, agricultural engineer, and Su Su San and Hlwan-Oo, assistant scientist and researcher, respectively at the IRRI Myanmar office. The event was organized by Closing Rice Yield Gaps in Asia with Reduced Environmental Footprints (CORIGAP-PRO) and MyRice project. CORIGAP-PRO is funded by the Swiss Agency for Development and Cooperation, while MyRice is funded by the Australian Center for International Agricultural Research. talks about the impact of mechanizing rice harvest. 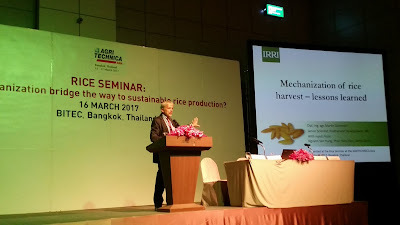 BANGKOK, Thailand— “There is a need to mechanize the rural areas to increase productivity as that is a key driver for change in the rice sector,” Dr. Bas Bouman, the director of a global partnership platform for making rice research more effective in meeting development challenges. 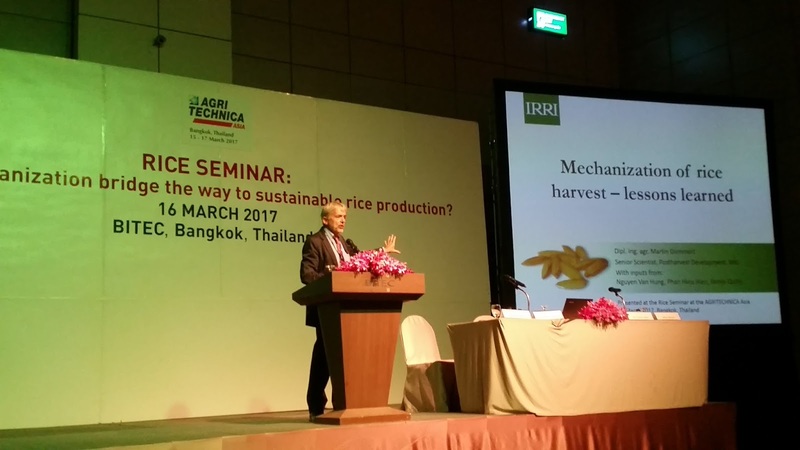 The leader of the CGIAR Research Program on Rice (RICE) made the statement at the AGRITECHNICA Asia, a trade fair for agricultural machinery and equipment held at the Bangkok International Trade and Exhibition Center on 15-17 March. Bouman, an expert on sustainable agricultural development and food security at IRRI, presented IRRI’s mission to combat poverty, food security, health and environmental issues, and promote sustainable rice production. “Mechanization should benefit farmers to have a better life and income and make good quality rice available in the market,” he said. Bouman also rallied the audience to take part in the sustainable rice platform in order to help small farmers maintain productivity while minimizing the environmental and social footprint. Bouman was joined by his colleagues who discussed other issues at the exhibit’s series of seminars on the role of mechanization in sustainable rice production. Engr. Martin Gummert, IRRI’s expert in postharvest technologies, presented the advantages and drawbacks in mechanizing rice harvest (in photo). “The rice combine harvester is a game-changing technology that made wetter grains available in big volume at harvest seasons putting pressure on the traditional postharvest system, especially grain drying,” he said. “Combine harvesters solve the problem of labor shortage and harvesting cost can be lowered by up to 60%. “However, unlike manual harvesting, combines leave rice straw in the field causing new problems,” Gummert added. For every 4 tons of rice grain, 6 tons of straw are produced. In Asia, this amounts to about 550 million tons of straw. Farmers usually dispose of the rice straw by burning or by incorporating the byproduct into the soil. “Both practices of burning and incorporating in the field have adverse impacts on human health and the environment through smoke and greenhouse gas emission, respectively,” said Dr. Bjoern Ole Sander, a climate change specialist at IRRI, as he discussed the effects of a changing climate on rice production and the environmental impacts of farmers’ practices in managing the rice straw after harvest. Sander proposed a combination of limited straw incorporation combined with the straw collection and off-field use as a climate-friendly alternative. Dr. Nguyen Van Hung, a research scientist working on rice postharvest and byproduct management at the institute, also provided workable options in managing the massive amounts of rice straw from the use of combine harvesting and how farmers can earn additional income while ensuring environmental sustainability and protecting the health of people in the community. 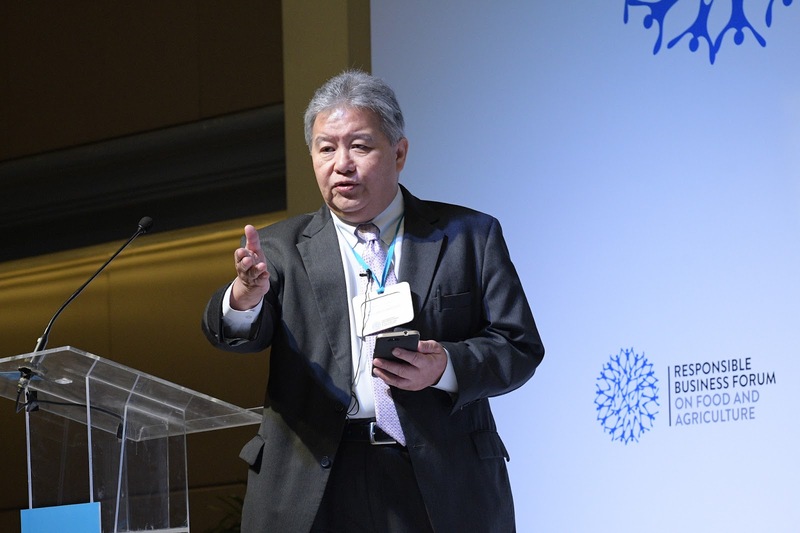 “We are using life cycle assessment of different rice straw management practices to help identify sustainable straw management practices and provide recommendations to policy makers,” he said. Engr. Carlito Balingbing presented the numerous advantages of laser-assisted land leveling technology and the many benefits that small rice farms have gained since it was introduced by IRRI in Asia in 1996. Laser land leveling is a climate-smart agriculture practice that helps conserve resources while increasing yields and farmers’ incomes. The benefits from a laser level fields include efficient water use, better weed and nutrient management, uniform crop maturity, among others. The current trends in contract farming and the different strategies for promoting sustainable rice in the market through appropriate packaging and labeling were covered by Dr. Matty Demont, the lead of IRRI’s market and value chain research team. The seminars led to enthusiastic discussions between IRRI and other organizations. 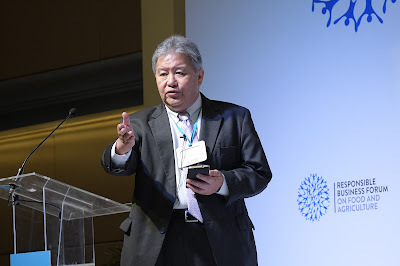 “We will develop further projects related to sustainable rice production using the updated information on rice straw management,” said Dr. Juejan Tangtermthong, the regional advisor on monitoring & evaluation at Better Rice Initiative Asia. Dr. Mayling Flores Rojas, an agricultural systems mechanization officer at the Food and Agricultural Organization, also expressed interest in developing collaborative activities with IRRI, particularly in mechanization and postharvest technologies. The AGRITECHNICA seminar series on the role of mechanization in sustainable rice production was organized by the German Agricultural Society (DLG) in collaboration with IRRI’s Postharvest and Mechanization Unit and GIZ through the ASEAN Sustainable Agrifood System. Dr. Grant Singleton, rodent ecologist and CORIGAP-PRO coordinator, discusses some of IRRI's contribution to environmental conservation. LOS BAÑOS, Philippines—“As the rising global population demands for more food, there is also increasing pressure in producing rice sustainably,” said Grant Singleton during a lecture on environmental conservation at the University of the Philippines Los Baños. 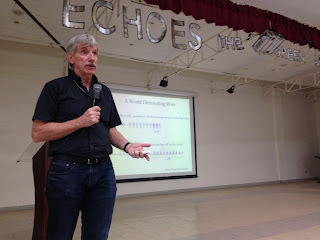 Singleton, a principal scientist and rodent ecologist at the International Rice Research Institute, was one of the notable speakers from different fields of environmental research at Overshoot: The Earth is an apple I can consume for a day, a seminar series organized by the UP Ecology and Systematics Major Students Society. The seminar, held on 13 March, featured the insights of experts on overconsumption and exploitation of natural resources practices and the potential solutions for sustainable growth and development. Singleton discussed the research activities of the CORIGAP-PRO (Closing rice yield gaps in Asia with reduced environmental footprint) project in alleviating poverty and improving food security and gender equity of small rice farmers in an environmentally sustainable manner. The project conducts adaptive research with rice farmers in demonstrating, testing, and validating the best management practices for sustainable rice production in major granaries in Asia. Some of these include One Must Do, Five Reductions in Vietnam, the Three Controls Technology in China, the cost reductions initiative in Thailand, and integrated crop management in Indonesia. CORIGAP-PRO aims to sustainably increase rice yield by 10% for 500,000 smallholder farmers in Asia by 2020. DoA and DoF partners. (Photo by Hnin Thiri Naing). MAUBIN Township, Myanmar—Aquaculture production in rice-based cropping systems could potentially boost farmers' productivity, income, and nutrition in the Ayeyarwaddy Region, the country’s main rice-producing area. H.E. 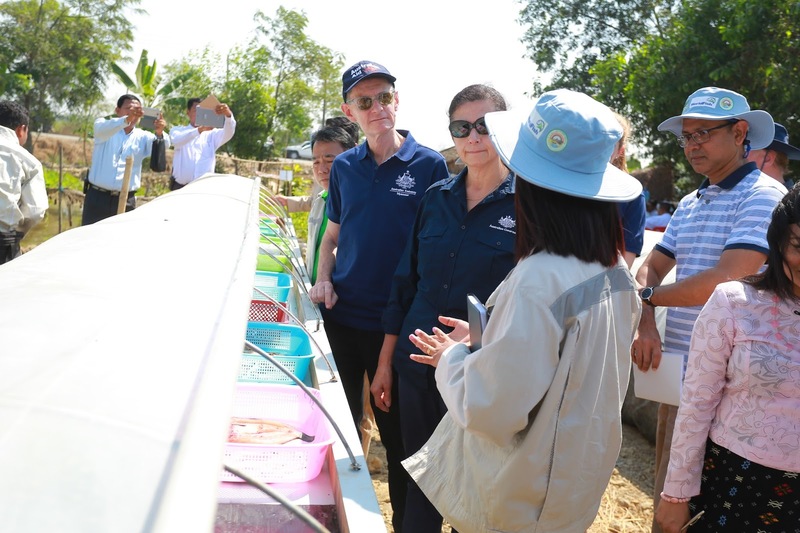 Senator Concetta Anna Fierravanti-Wells and other Australian officials visit the rice-fish trial project site in Tar Pet West Village. (photo by Hnin Thiri Naing). During the visit, the Minister had the opportunity to interact with some of the target beneficiaries of the project, many of them were women farmers. 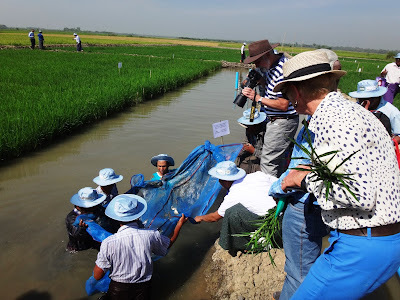 She found that, while most male farmers’ are mainly interested in growing rice, all the women farmers showed great interest in the rice–fish system for the nutritional value of the fish as a dietary component, as well as the extra income from selling their fish harvest. “I hope that the fish harvest from the project could help the nutrition requirement of the family,” H.E. Fierravanti-Wells said. She is also looking forward to outcomes from a larger rice-fish study funded by ACIAR that planned to begin in July. U Aung Kyaw, a participating farmer in the rice-fish project, informed the Minister that he will invite other farmers to visit his farm before and during harvest and explain the benefits of the rice-fish systems. He plans to expand the system in his 6-hectare farm next season. “The DoF also plans to apply the new techniques of rice-fish systems on a larger scale in areas where it is applicable,” said U Tin Mg Oo, DoF Maubin District Manager. In addition to the rice-fish production, the Australian officials were also briefed about the Solar Tunnel Dryer for fish and the Solar Bubble Dryer for rice, two postharvest technologies developed by IRRI and the University of Hohenheim in Germany that prevent smallholder farmers from losing large portions of their harvests. Mr. Yan Linn Aung, a postharvest development specialist, explained the benefits and advantages of Solar Bubble Dryer for rice. The dryer minimizes the effects of unpredictable weather during the drying of the grains. It also traps solar radiation to heat the paddy while ventilators push the moisture out. 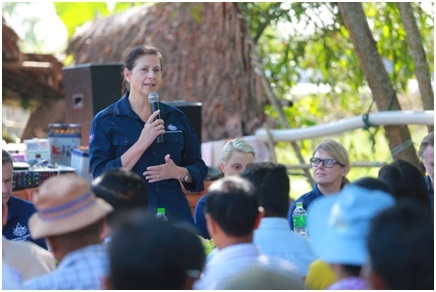 “This field visit provided me additional knowledge on the technologies IRRI and World Fish have developed on-farm,” said Ambassador Coppel. The IRRI Team is led by Dr. Labios with Dr. Jongsoo Shin, Mr. Aung Myo Thant, Mr. Aung, Ms. San, and Ms.Tin Tin Myint. The WorldFish team is led by Dr. Karim with Dr. Nilar Shein. leads the discussion during the rice working group panel of the 2017 Responsible Business Forum. JAKARTA, Indonesia—More than 600 decision makers from public, private, and developmental sectors participated in the 4th Responsible Business Forum (RBF) on Food and Agriculture to establish innovative and collaborative approaches to food and nutrition security in the Asia-Pacific Region. Held on 13-15 March, this year’s theme is Securing Asia’s Food and Nutrition Future: Enhancing Access to Finance, Technology, Knowledge, and Markets. Representatives of business, governments, international developmental agencies, and farmers attended the event and will produce actionable recommendations for increasing productivity through agricultural sustainability, product innovation for food safety and nutrition, and collaboration along the entire food chain. The guests of honor and speakers at the 4th RBF included Indonesian Minister for National Development and Planning Bambang Brodjonegoro, Indonesian Land and Spatial Planning Minister Sofyan Djalil, Permanent Secretary of Myanmar Ministry of Agriculture, Livestock, and Irrigation Tin Htut, and Philippine Department of Agriculture Undersecretary for Policy and Planning Segfredo Serrano. LOS BAÑOS, Philippines—Around 40 scientists from major partner institutions participated in the kickoff meeting for the CGIAR Research Program on rice agri-food systems (RICE) at the International Rice Research Institute (IRRI) headquarters on 6-8 March. RICE, the second phase of the Global Rice Science Partnership (GRiSP), provides a single strategic plan and unique new partnership platform for impact-oriented rice research for development. It streamlines current rice research for development activities of the CGIAR and aligns them with more than 900 rice research and development partners worldwide. Scientists from the Africa Rice Center, International Center for Tropical Agriculture (CIAT), Centre de coopération internationale en recherche agronomique pour le développement (Cirad), Institut de recherche pour le développement (IRD), Japan International Research Center for Agricultural Sciences as well as representatives from the CG System Management Office attended the RICE inception workshop. Along with IRRI scientists, the participants conducted a detailed planning of the 2017 activities under the flagship projects. They also reviewed the theory of change, updated the list of outputs and outcome milestones, and discussed several cross-cutting issues such as gender; capacity development; monitoring, evaluation, learning (ML&E); impact assessment; communication; open access; publications; cross-CRP collaboration/site integration; and intellectual asset management. The RICE Program Planning and Management Team, represented by deputy director generals and senior scientists from the partner centers and the flagship project leaders also discussed budgetary and operational issues. 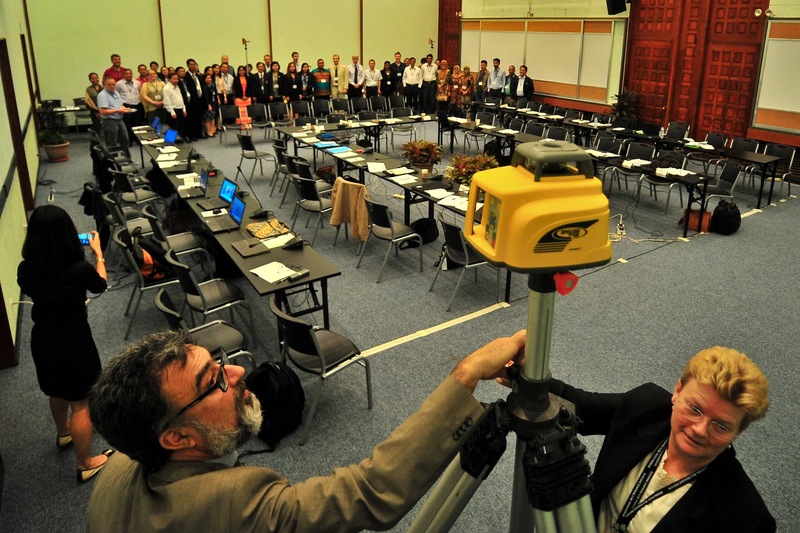 On 9-10 March, the RICE Independent Steering Committee (ISC) convened to review the GRiSP experience and the terms of reference of the new ISC. The ISC is composed of seven external experts; representatives from the respective Board of Trustees of IRRI, AfricaRice, and CIAT; and the director generals of IRRI and AfricaRice. The committee assessed the targets, indicators, milestones, and budget of the flagship projects and cross-cutting activities. The ISC will formulate recommendations and continue to monitor activities under RICE. 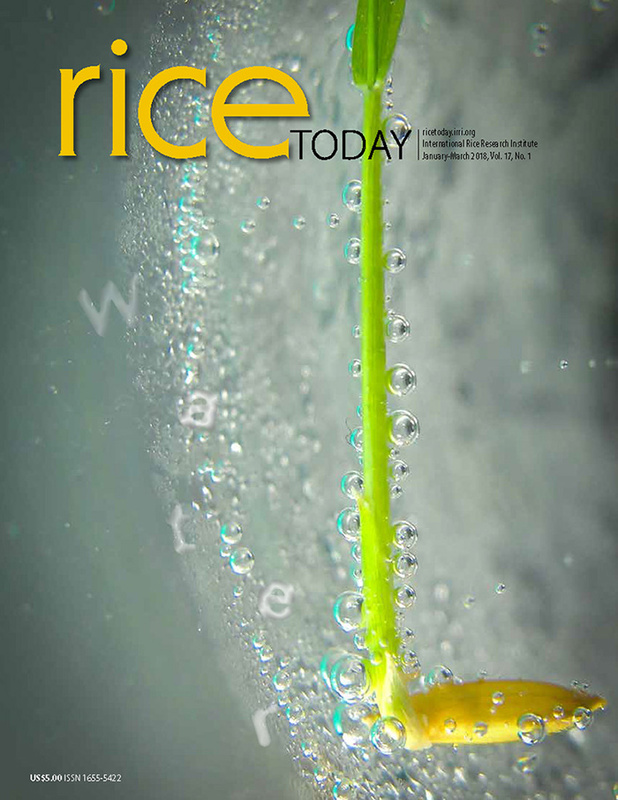 For more information about RICE, please read Continuing global partnership through rice. The UPLB Rice Varietal Improvement Team receives the 2016 outstanding research team award. LOS BAÑOS, Philippines—The Rice Varietal Improvement Team (RVIT) of the University of the Philippines Los Baños (UPLB) received the 2016 outstanding research team award during UPLB’s 108th Foundation Day on 6 March. Since 2011, the RVIT Team has introduced five rice varieties, which are products of hybridization and selection adapted to rainfed lowland rice ecosystems and drought conditions. These varieties have been certified by the National Seed Industry Council (NSIC) of the Philippines and are commercially available as NS Rc276 (Sahod Ulan 4), NSIC Rc282 (Sahod Ulan 7), NSIC Rc286 (Sahod Ulan 9), NSIC Rc398 (Tubigan 34), and NSIC Rc 418 (Sahod Ulan 14). In 2009, the team, in collaboration with the Philippine Rice Research Institute, released NSIC Rc204H (Mestiso 20), the first two-line hybrid rice in the country. The RVIT continues to pursue developing superior rice varieties, which is a task that began in the 1960s. The RVIT Team is led by Dr. Jose Hernandez of the Institute of Plant Breeding and is composed of Teresita Borromeo, Pompe Sta. Cruz, Danilo Lalican, Senen Escamos, Sancho Bon, Ernesto Cayaban, Jr., Ann Mylalulex Magnaye, Katrina Malabanan-Bauan, Alfredo Sinohin, Ester Magsino, Fe Alzona, Angelina Felix, Melissa Pino, Edna Mercado, Juan Mateo, Loreto Caoagdan, Romeo Juarez, and Bernalito Nuñez. MAUBIN TOWNSHIP, Myanmar—Rice farmers in Ayeyarwady and Bago Regions are reaping the benefits from the adoption of new improved rice varieties, best crop management practices and post-harvest management introduced through two collaborative projects funded by the Australian Centre for International Agricultural Research (ACIAR). The projects focus on improving farmers' profitability and the productivity of rice-rice and rice-pulse cropping systems and promotes a system where fish are grown concurrently with rice. 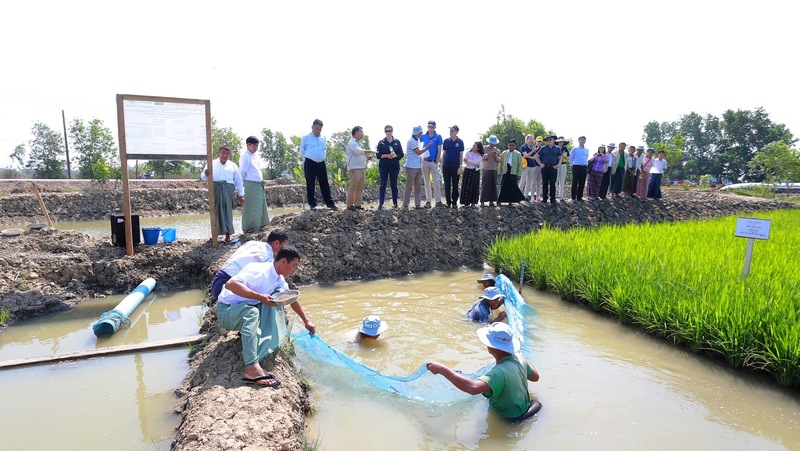 “The project enhanced the knowledge and experience of our technicians while farmers benefited significantly from the improved technologies and best management practices (BMP) for rice-rice and rice-pulse production and post-production,” said U Theik Soe, DoA District Manager. The team also visited the farmers’ 2-hectare seed production area for Yaenelo 7, a drought-tolerant rice variety suited for the summer cropping season, and the 5-hectare BMP showcase for summer rice. The BMPs include improved varieties (Yaenelo 4 and Yaenelo 7), drum seeder for row planting, and improved nutrient, pest, and weed management. “I could make more money by selling seeds since the price is higher than grain,” said U Kyaw Thu, a farmer and seed producer. 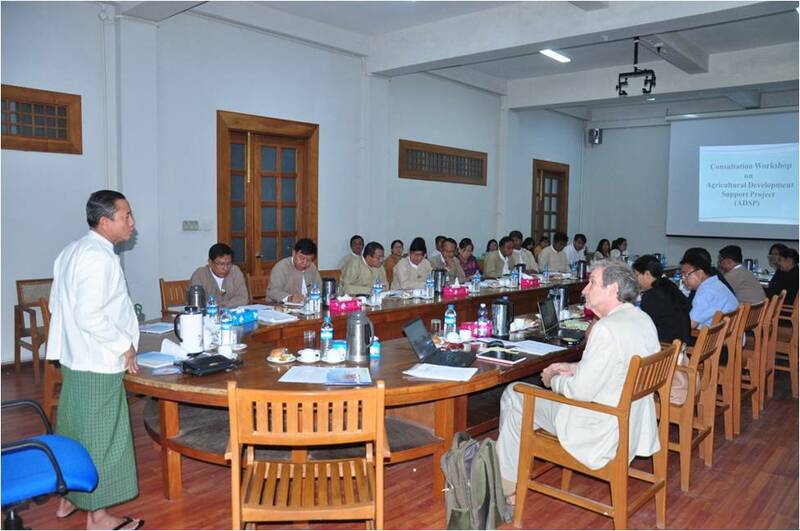 “I am happy to see that IRRI and WorldFish works together and produce effective achievements on-the-ground in Myanmar,” said Campbell. The ACIAR Commissioners included Don Heatley (Commission Chairman), Catherine Marriot, Lucinda Corrigan, Tony Gregson, John Cook. Other accompanying delegates were Eleanor Dean (general manager, Outreach and Capacity Building), Peter Horne (general manager, Country Programs), Suzanne Gaynor (executive officer), Maree Livermore (executive officer, Country Programs), Dulce Simmanivong (regional manager), Ohnmar Khaing and Myo Thura (ACIAR Myanmar program manager and program coordinator, respectively). The IRRI Team for MyRice is led by Dr. Grant Singleton with Dr. Romeo Labios, U Aung Myo Thant, U Yan Linn Aung, Daw Su Su San, and Daw Tin Tin Myint. The World Fish Team is led by Dr. Michael Akester with Drs. Manjurul Karim and Xavier Simon André Tezzo. The International Water Management Institute was represented by Dr. Robyn Johnston.